Plant Bugs belonging to the family Miridae feed by means of piercing-sucking mouthparts - their food is strictly liquids pumped up out of the plant's tissues. Thus the open holes in the leaf at left were not created by these bugs. Feeding sites created by plant bugs would appear as slight pin pricks. Notice the intricate texture of trichomes (plant hairs) on the leaf. These can influence the way insects walk and navigate over the leaf surface. Their legs could become entangled or hindered just as they are attempting to escape a predator. Sometimes plant trichomes can even trap and kill insects, especially if they are also gland tipped. Notice that many of the trichomes in the close up photo below have star-shaped tips. From Wikipedia: The large and diverse insect family Miridae contains the plant bugs, leaf bugs, and grass bugs, and may also be known as capsid bugs. It is the largest family of true bugs belonging to the suborder Heteroptera, with over 10,000 known species and new ones constantly being described. They are small, terrestrial insects, usually oval-shaped or elongate and measuring less than 12 mm in length. Some are brightly colored, others drab or dark. 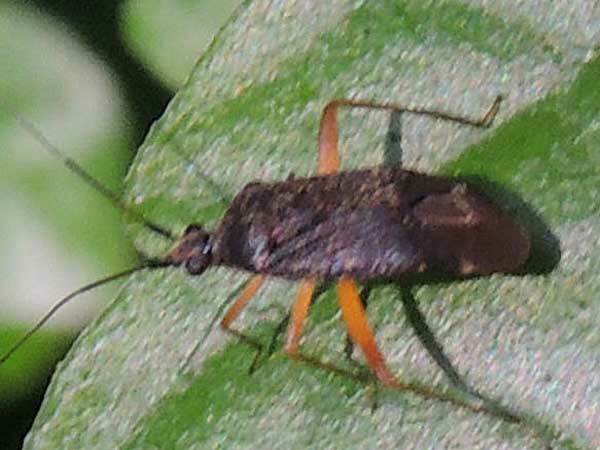 Most of the more well-known mirids have received attention because they are agricultural pests. They pierce plant tissues and feed on the juices. Copyright Michael J. Plagens. Page created 8 May 2017.